Unique Moments Photography always provides digital files with their wedding packages. Clients can use them for personal use only. What are you going to do with all your wedding images that you will receive as part of your wedding package? "Lets us Tell your story" with a custom designed album. Its the best way to display your story. Create a lifetime memory and a family keepsake with a custom designed album. Its simple. Select at least 75 of your favorite images and we will do the rest for you. 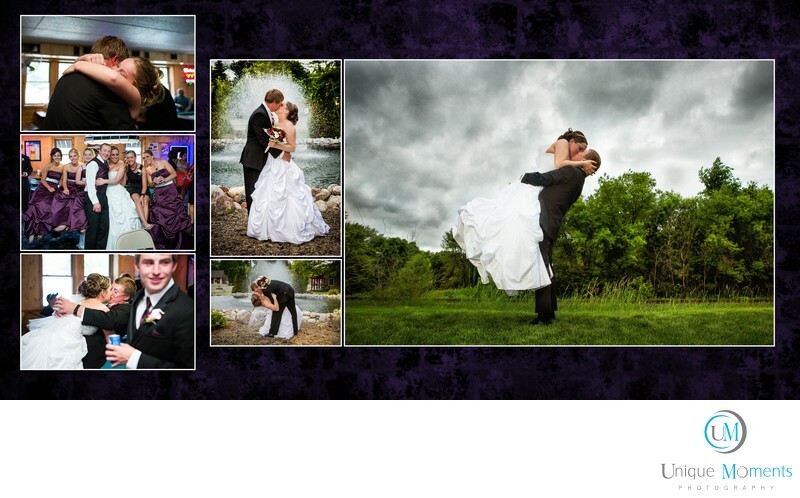 We will fully edit your selections, apply artistic enhancements and create your wedding album. Our custom album designs are 16 pages 32 sides on a 10x10 album spread. Album design fees are $450.00 and you can select any album from any company. We design it for $450.00 and you get to buy your selected album at our direct costs. Additionally, as an added perk, you also get all your album files returned to you in a full size jpeg format. There are so many great choices. We use Finao, Vision art and Pictobooks for our album selections. Price points for an album start at $140.00 but you can spend much more for bigger and higher quality albums. There are endless choices for albums. We want you to be 100% happy so that is why we decided to design them for you at a Fair rate and let you choose what style will work best for your needs. Please note that No Publication in a commercial magazine or on line blogs are allowed with your images with out written permission from Unique Moments Photography.